VP CONTENDERS ABOARD THE ROMNEY BUS: From pouring syrup on pancakes to revving up a crowd, Mitt Romney road-tested a number of potential running mates this weekend as they joined him on his "Every Town Counts" bus tour, as ABC News' Michael Falcone and Emily Friedman reported. 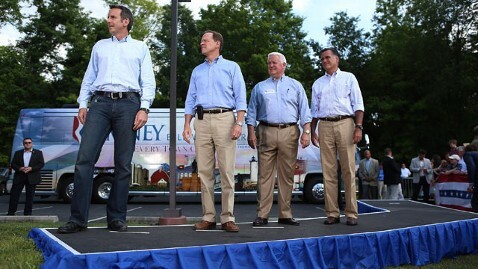 Former Minnesota Gov Tim Pawlenty and Sen. Kelly Ayotte, R-N.H., appeared with Romney as he kicked off his tour in New Hampshire Friday, and Pawlenty continued his tryout in Weatherly, Pa., Saturday as he fired up a crowd before Romney took the stage. Sen. Rob Portman, R-Ohio, and his wife, Jane, joined Romney in the pancake line in Newark, Ohio, slathering on syrup on voters' pancakes handed to them by the presumptive GOP nominee. PORTMAN, WHO? While he is widely considered a top vice presidential pick, Portman's name recognition in his own home state is still pretty low, as ABC News' Amy Walter found this weekend when speaking to Ohio voters attending Mitt Romney's rallies. "Here in northeastern and central Ohio, even among the GOP faithful, his name draws more question marks than exclamation points. Theresa, Tami and Tim Clark, siblings from Lancaster Ohio, stood in a sunny town square in Newark waiting for Romney to arrive and address the assembled crowd," Walter reported. "When asked what they thought about Portman as a potential VP pick, Theresa admitted she didn't know much about him. 'What state is he from?' she asked. Her brother Tim, replied that 'he's a senator or a representative' from Ohio." RUBIO'S BIND AFTER OBAMA IMMIGRATION MOVE: Sen. Marco Rubio, R-Fla., is in a bind, like most of the GOP, after the Obama administration issued new rules regarding the deportation of undocumented students. Rubio, who is crafting his own alternative to the DREAM ACT, issued a statement Friday calling the decision "welcome news for many of these kids desperate for an answer," but also cited the president's move as one that is "ignoring the Constitution and going around Congress." But a Rubio spokesman also told CBS News' Norah O'Donnell that he might not introduce his immigration legislation after Obama's announcement Friday. "Obama's move kicks the can down the road for two years," the spokesman told O'Donnell. PAWLENTY: OBAMA FAILED ON COMPREHENSIVE IMMIGRATION REFORM: On ABC News' "This Week" Sunday, Pawlenty said President Obama is at fault for not pursuing comprehensive immigration reform in his first term as he promised. "He looked the American people in the eye when he ran last time and promised that he would do his version of comprehensive immigration reform in his first term," Pawlenty said on the "This Week" roundtable. "He had the full run of the table, and he failed to get it done, like he's failed to get so much else done." DID CHRISTIE MISS HIS W.H. CHANCE? N.J. Gov. Chris Christie made the decision last October to stay out of the presidential race, and Newsweek's Peter J. Boyer looks at whether Christie's verdict was his missed opportunity to be commander-in-chief. CHRISTIE'S BUDGET MOVES: As he battles with N.J. Dems on budget decisions, Gov. Chris Christie might tap into dedicated revenue, the Wall Street Journal's Heather Haddon reported. "As he seeks a historic income tax cut, Gov. Chris Christie has turned to an old New Jersey budget trick he had once forsworn - tapping government funds dedicated to other priorities for nearly $900 million in one-time sources of money," Haddon wrote. "The proposed use of dedicated revenues - a form of revenue often called a one-shot - has increased threefold since Mr. Christie's first budget in 2010, and is nearly seven times as much as he put in last year's spending plan, according to an administration analysis reviewed by The Wall Street Journal. A separate analysis by The Wall Street Journal using state Office of Legislative Services data found that Mr. Christie has proposed $887 million in one-shots - nearly 3 percent of the 2012-13 state budget. The Republican governor has risen to national GOP fame as a fiscal conservative who in his first budget address denounced the use of 'one-time gimmicks that have worsened our situation.' But now Mr. Christie faces the reality of underperforming tax collections just as he is set on passing a substantial tax cut by the end of the month." PA. GOV'S ADVICE ON VP PICK: Pennsylvania Gov. Tom Corbett doled out a bit of advice for Romney as he considers who to select as his running mate this fall: Pick a governor. "According to the Republican governor of Pennsylvania, Mitt Romney's short-list of potential running mates can get a lot shorter," ABC News' Michael Falcone reported. "Tom Corbett, the first-term governor of the Keystone State, cited only fellow state chief executives when asked on Saturday who he viewed as the top contenders to join the presidential ticket. 'I'm leaning towards the executives who had to make tough decisions,' Corbett said in an interview. 'Because I think where the president has stumbled when he came into office - he was never in that executive position where - it's not just a vote, it's the decision.'" @JebBush: Are the President's actions today w/in his authority? He didn't think so in a non election year. VIDEO. @timpawlenty: Thinking about my dad Gene today. Parenting 5 kids took humor, patience, love and hard work. Miss and appreciate him more than ever. @SenJohnThune: 1/2 The highest calling of my life has been to try to be the kind of father to my two daughters that my dad has been to me. @GovMikeHuckabee: Obama administration isn't going to deport illegal immigrants, just the really illegal immigrants.